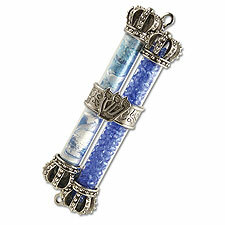 An exquisite collection of fine Mezuzah Covers for your Home or office. These Mezuzah cases by Quest are not only for practical private use, they make the most meaningful gift for any Jewish recipient. ALWAYS made of superb quality metals and finished to the very last detail with the finest materials as high polishing, 24K gold, Swarovski crystals etc, depending on the particular item. Your children and generations to come will appreciate and adore the investment you made in these upscale complimentary Mezuzah covers.